Black nightshade is a native annual found throughout most of England but becoming rarer northwards and local in Wales. It is recorded up to 1,000 ft. Black nightshade is a plentiful and troublesome weed of agricultural and horticultural fields and gardens. It occurs on a wide range of soils but prefers soil rich in nitrogen. 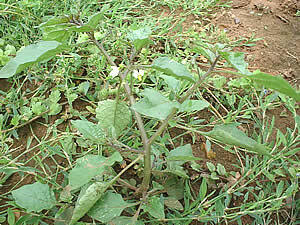 Black nightshade exhibits a high level of variability and several sub-species have been identified. Some populations have developed resistance to the triazine herbicide atrazine. Black nightshade flowers from July to September. A plant can produces up to 400 berries each containing about 40 seeds. An average plant produces 9,000 seeds but a large plant may have 153,000. Seed from unripe berries tested 27 days after flower opening gave 100% germination. Even seed collected at just 15 days after flowering gave germination levels of 20% after a period of dry storage. Seedling emergence begins in early May, reaches a peak in late-May or June, declines in July-August and ceases in September. Most seedlings emerge from the surface 25 mm of soil. Black nightshade grows rapidly after germination and the time from emergence to flowering is around 60 days in May and 50 days in July. The seedlings and mature plants are susceptible to frost and late-germinating seedlings are unlikely to reach maturity. Black nightshade seeds recovered from excavations and dated at up to 80 years old are reported to have germinated. Seeds buried for 39 years in undisturbed soil have given germination levels of over 80%. The soil temperature deeper in the soil remains relatively constant and nightshade seeds require alternating temperatures in order to germinate. Seed in cultivated soil would be expected to receive a favourable temperature regime; nevertheless, some seed is still likely to remain dormant and viable for at least 5 years. The annual decline of seeds in cultivated soil is estimated at 37%. Small mammals disperse the fruits and seeds. Birds eat the berries and viable seeds have been found in their droppings. Black nightshade seeds have also been found in cattle droppings. A study in Denmark has shown that the seeds can survive in silage made from sugar beet tops. In slurry heated for dry transportation, black nightshade seeds survived heating at 50°C for 15 minutes but were killed by 3 minutes at 75°C. Control is by surface cultivations in spring and the growing of crops that can be hoed easily. Berry formation must be prevented by tillage, mowing or the pulling of mature plants. Infection of the plant with tobacco mosaic virus reduces seed viability. Black nightshade is not eaten by rabbits. In greenhouse tests in the USA, corn gluten meal (CGM) applied as a surface or an incorporated treatment has reduced the emergence and growth of black nightshade.